Style guides present the preferred forms and styles for editors to apply to texts they are editing. Style guides collect the knowledge and experience of many editors over many years. In Australia, the style guide set for all Commonwealth government publications is Snooks & Co., Style Manual for authors, editors and printers, 6th edition, published by John Wiley & Sons Australia, 2001. It has become the preferred Australian style guide, including for most universities and publishing companies in Australia. This is the style guide I usually refer to when editing. Please let me know if you would prefer me to use another style guide or if you have a house style. The preferred style guide for writers in the behavioural and social sciences, APA 6th edition is required by many universities and journals. It is consulted not only by psychologists but also by researchers and students in business, education, nursing, social work, anthropology, ethnology, sociology and other fields. 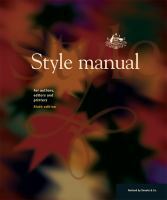 Many Australian universities ask their students to use the Australian Style manual for general style decisions and APA for citation style. When editing, editors refer to many references, none more so than dictionaries. The Macquarie Dictionary is the accepted dictionary for Australian publishers. If your publication is for an international audience, you may wish to apply US spellings, for example, 'z' not 's' in organisation, or '-or' not '-our' in harbour. Unless you prefer another dictionary, I will use the Macquarie Dictionary Online when editing your publication or document. Please let me know if you prefer another dictionary.